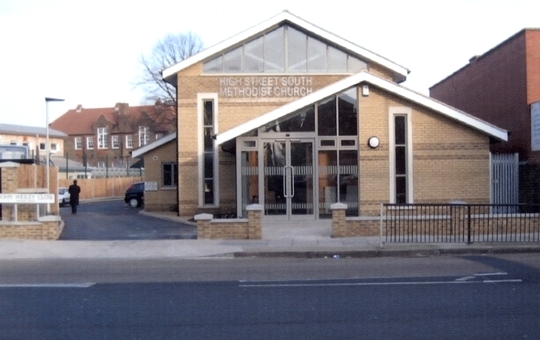 Welcome to East Ham High Street South Methodist Church ! Java Script is currently disabled on your machine. Please check your browser settings and reconfigure as necessary. and a warm welcome to this web site ! East Ham High Street South Methodist Church is a member of the Newham circuit of Methodist churches. Our original church building dates from 1872 (see the article below for a fascinating church history !) and was totally redeveloped and re-opened in February 2007. Directions: The nearest Underground/DLR stations are East Ham and Beckton respectively. From there a 101 or a 474 bus will take you to High Street South (A117). The Church is on High Street South adjacent to John Wesley Close (private road) and opposite the junction with Marlow Road. Please read our Introduction to Methodism to find out more about the Methodist church. Also of note is the E-news bulletin from the Methodist HQ in London. As long as ever you can." The following document was written by Mr. Ted Jarman in 1972 for the centennial celebrations. The familiar sight of the local church or chapel in the main thoroughfares of our towns and cities is fast disappearing. The reasons for this are of course many and varied. 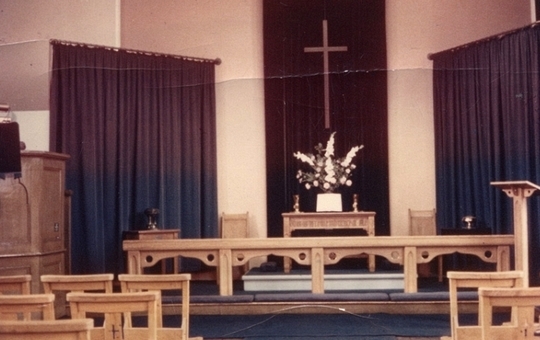 Town and Country Planning Schemes and road development projects have in some instances been responsible for the re-siting of the local church into the adjacent side street and with it the attendant loss – as the focal point of worship in the everyday life of the community. The business, the property owner, and the speculator has for many years cast longing eyes on those central and important positions which the church building has occupied in the "High Street" and made generous offers to the parochial church council or trustees to purchase, with that result that all too often the "supermarket" designed to supply the physical needs of the populace has replaced the "shop" which supplied the means by which men and women could enjoy spiritual refreshment. In such cases the church has been rebuilt on the odd site at the rear of the busy main thoroughfare – often in modern garb – with all the modern conveniences which the old gothic buildings lacked, but alas! Its notice boards are read by but a few. There are other instances where, sad to relate, the changing population of the change in outlook, or even both, has left the local church bankrupt, and the inevitable loss of an active membership as well as the necessary financial means of support has meant that the church has been to close its doors forever; and all too often one is able to see a warehouse or factory, where, although efforts have been to obliterate the fascia of the building, the windows on the side walls or the rear of the building tell their own sad story – that it was once a place of worship – church. On reflection, one is reminded that all these churches had their beginnings, for although they end their days with the music of the factory machinery and the noise one associates with warehouses and store-rooms echoing through the walls, this was not the purpose for which they were built. It would make an interesting study as to how these churches and chapels came into being. Some can trace their birth back into antiquity, having historic associations with Norman or Saxon times. Others of course can only date their birth in recent times, in some cases so recent that they were only founded within this generation. 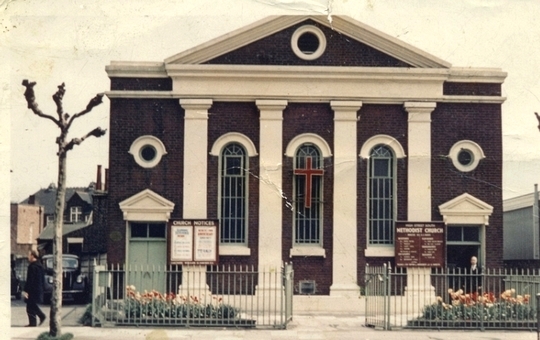 It needs to be said that there are many churches and chapels which can make claim to the fact that after many years of witness they still enjoy a full and vigorous life, and a church that can make such a claim is the Methodist church situated at the corner of Vicarage lane in the High Street at East Ham, which this year celebrates its centenary. It is not intended that this booklet should cover those one hundred years, for time and space "would fail to tell" of those who played their part. It is know that they come from all walks or life, professional and artisan in the work-a-day pursuits. Some spent long hours in dingy offices perched on those Victorian styled high office stools, crouching over equally high office desks with flaps and footrests, the everyday atmosphere of starched white collars and cuffs, of dusty ledgers and files, the familiar world in which a century ago, the cleric eeked out a meagre existence. Others faced the laborious and arduous duties in farming and industry. History tells its own story of the long hours and low pay, the legacies of the industrial revolution. Yet, despite all, these men and women continued the work which has such a humble beginning in the village of East Ham in the year 1872. In order to piece together the history of a town, village, church, or person, the chronicler is almost entirely dependent on local records, and from the local archivist certain information is often available although sometimes limited. It is therefore necessary to point out from the very onset that the principle sources of information available in order that this brief history can be produced are based upon references made in two books. In a book published in the year 1884, entitled "Reaching the Masses", the Rev. R.S. 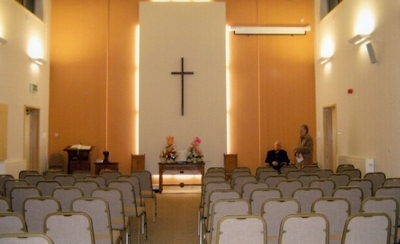 Blair makes reference to the chapel in a chapter on "Mission Work at East Ham". In the second book, "From Village to County Borough" published some 35 years later, the author Mr A.J. Stokes makes reference to the chapel, though it is fairly obvious that most of his information came from the Rev. Blair's book. There is in addition a reference made to the church in a second book by the Rev. R.S. Blair entitled "Nailing up the Old Barn Door"
Both of these references deal specifically with the events associated with the first few years of life of the church, commencing with the first service held in a small dwelling house, but it from the old newspaper cutting, the concert ticket, and the old programme, which has managed to survive the waste paper basket, that we are able to catch a glimpse of the daily life of the church and it's people. The Year 1868 saw the passing of the Barking Bill, which gave the necessary authority of the river site between Barking Creek and the Galleons Reach, known locally as the North Woolwich Marshes, to be developed as a gasworks. In that same year the first pile was sunk, laying the foundations of what was to become the river wall and riverside boundary of Beckton Gas works, and almost to the day in 1870, the first gas was manufactured at this works. There is an interesting and important connection between the building of these new works and the founding of the chapel in the nearby village of East Ham, situated some two or three miles away to the north east, for the man who was destined to become the founder of the church, was employed in what was to become the biggest gas works in Europe. East Ham originally consisted of three separate hamlets: North End, South End and Wall End, and in the year 1871, the parish of East Ham consisted of some 697 houses with a population of 4,334. In those days the village experienced the quiet air one associates with a village, the population of just over four thousand was scattered throughout these three hamlets. It was apparently possible to distinguish between the North End and the South End, by the way each made particular use of the land. At the North End, due to the nature of the soil, the villagers cultivated the land for the production of market gardening produce, which inevitably found its way into the great London market. It appears that the great variety of cabbage produced had quite a reputation, for it was believed that the cabbage seed grown in this area has world wide fame, at least the growers were convinced on this score. In the southern part of the district, the land was used for rearing cattle. This area mostly consisted of marshland, stretching from what is now Barking Road, right down to the River Thames, and according to records, the largest ox ever bred in England was raised in these marshes in the eighteenth century. One writer, in describing his early recollections of the northern part of the village, refers to the red tiled cottages with their white washed fronts, with gardens stocked with vegetables and the rustic seats for the villagers to sit and while away the time on pleasant summer evenings. It was a common site to see the sheep and cows being driven to market and the sight of the old farm wagon laden with produce lumbering its way along the county lanes, plying between farm and market, was a daily occurrence. The village was able to supply its inhabitants with their day to day commodities through the several shops scattered throughout, which included the familiar post office, but for the additional requirements, a visit to Barking was necessary, and if the services of a Doctor were required, this also meant a visit to nearby Barking. But ere long the peace and tranquility was to be shattered forever, for it was inevitable that the industrial monster, already gaining strength, was bracing itself for the great plunge, for history tells its own story. For within a space of a few years, it has ploughed its way through the entire area, and the village of East Ham was numbered with many others who have suffered a similar circumstances. The great Royal group of docks was already expanding and preparing itself to take the vast number of ships, which were to bring their merchandise from the four corners of the world and make their return journey with cargoes of a different kind. The new gasworks had also set upon its great task of supplying the City of London from its riverside home. These events heralded the closing of an era. The village as such was about to change its role. Cabbages and cattle were no longer the priority, but men and houses, men for the dockyard and men for the gasworks and houses, hundreds of them, in which the ever increasing population was to make its home. An employee of the newly formed gasworks was a certain Mr. A.G. Batten, of whom it is recorded at the time of his conversion was unable to read. In order that he might be able to read his Bible, he sought the assistance of his colleagues during the dinner time break, confessing to them that he was only familiar with a few words, such as "and", "but" & "that", and had only quite recently got to know how these words looked in print. He therefore asked their permission if he could read a chapter of the bible to them during their break for a meal, a strange request for one who had already made such an admission, and so with such limitations for one whose complete knowledge of words was confined to those with one syllable, he proceeded to read aloud a selected passage, spelling out letter by letter the words he could not recognise, let alone pronounce, and relying entirely on the guidance of his fellow workers to give him the correct pronunciation. So keen was he to learn that on more than one occasion the dinner time period had passed without his having eaten his meal. After having conquered his inability to read, he wanted to continue his activities, and decided to preach the gospel to others. 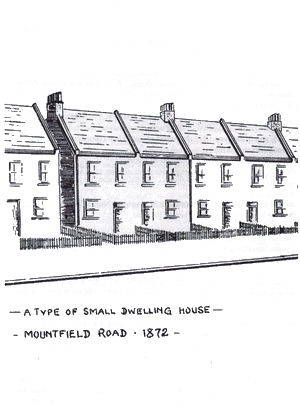 In order to do this, he took it upon himself to be responsible for renting a small cottage type house for 5/6d a week at 17 Mountfield Road, and so in July 1872 he led his first service. The Rev. Richard Blair then takes up the story. He had recently moved into the area to take up duties in the then known London 8th circuit of the of the Primitive Methodist Connexion, and was responsible amongst his other duties for the mission work in East Ham. Apparently Mr. Batten had moved from the original premises to a house opposite some years previously, once again making himself responsible for the rent. By this time he was finding the financial burden rather difficult, due to the fact that he had to find the rent for two houses: the "church" premises in Mountfield Road and his own house in Wellington Road. 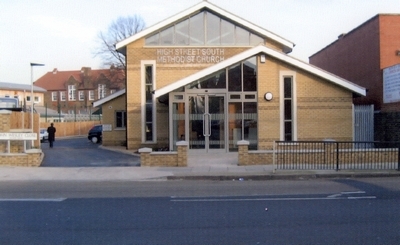 The Primitive Methodist Organisation, when approached, agreed to supply the preachers for conducting the Sunday services, and the "church" in Mountfield Road was duly placed on the circuit plan of the Methodist Church in the year 1878, and it was recorded at the first service that only one person was present. The situation did not continue for very long. Open-air services were held and house-to-house visitation was organised in the surrounding area, and from then on the "house-church" became a centre of activity with a church membership of some 33 members and a flourishing Sunday School. The Sunday School presented an immediate problem due to the lack of teachers and accommodation. It therefore became necessary to seek the services of suitable teachers from the nearby Beckton Church and the accommodation problem was partially solved by making full use of the rooms upstairs and down. The house had already been referred to as a small dwelling and with some 100 children gathered together, every Sunday space was a premium. As for the normal Sunday services, the person conducting the service had no alternative but to stand at a point between the two doorways and preach to the people gathered in both rooms. Needless to say, the atmosphere was far from comfortable as the worshippers crowded and crushed together. The obvious need was for a building large enough and suitable for the people to worship in, and in which to be able to continue the work on which they had embarked. The first glimpse of hope came when a benefactor, himself a churchman, made an offer to the Rev. R.S. Blair. His offer, a site of land with an area consisting of some 620 square yards, at a nominal rent of £1 per annum for 999 years, carrying with it an important condition stipulating that a temporary place of worship be erected on the site, and that it should be replaced by a substantial brick built chapel and school room at a value of some £600 within a space of ten years. 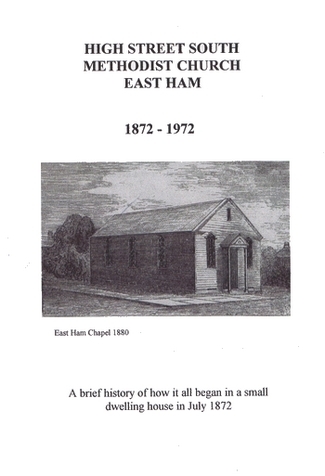 "With reference to the accompanying proposal for the erection of a temporary chapel for the Primitive Methodist Connexion, at the lower end of the village of East Ham, we are happy to be able to offer our hearty approval of it, arising from a personal acquaintance with the good already done, and of the great need which exists for extended accommodation. We are glad to express our confidence in the Rev R.S. Blair and his fellow workers, and our belief that the proposed building, and the work intended to be carried out on in connection with it, are worthy of your support." The existing church buildings now stand on the original site and during the years, two alterations have to the site have been necessary. First of all the frontage area was reduced in order to make room for the widening of the lane, into what is now known as High Street South, the main thoroughfare to the docks and the industrial area bordering on the river. Then again in recent times the site was extended at the rear, when a portion of land became available between the existing site and the school boundary and was duly purchased by the trustees. The certain Mr. D.H. Fry, who gave his support to the proposed scheme of erecting a temporary chapel on the site, was the son of Elizabeth Fry, who devoted her life to the promotion of prison reform and herself gained a considerable reputation as a preacher. It is a comforting thought to realise that the confidence expressed many years ago has been fully justified. With this generous offer of such a valuable site, the question of a suitable building was the next obstacle to be overcome. This became more difficult when one realises the additional population that was moving into the area and the surrounding districts. The Rev. R.S. Blair, during a period of six years, had undertaken the task of erecting some five chapels and the enlargement of two others, and this meant of course that the strain on the financial resources was inevitable. He was therefore having to find additional support from his friends to assist in the erection of these buildings. It therefore became fairly obvious that the erection of a permanent building in East Ham South was out of the question. Consideration was given therefore to the purchase and erection of a temporary wooden building. A suitable one was found to be available for the cost of £10, but the person who initially agreed to sell it withdrew from the deal before it could be finally settled. According to the county of Essex records covering Victorian history, the High Street, East Ham Primitive Methodist Church was registered as a place of worship on 2nd April 1883 and is recorded in the General Register Office Worship Register. This original document is held by the trustees. 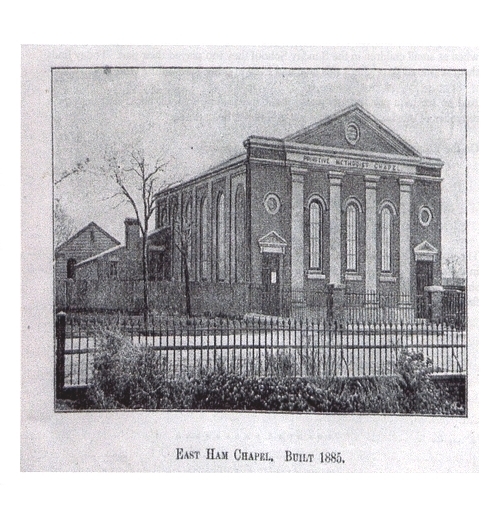 Within ten years, between 1881-1891, the population of East Ham trebled and the work and activities at the temporary chapel continued to grow, and the need for a larger and permanent building was becoming vitally necessary. By the year 1885, certain developments brought the project of a new building nearer fruition. First of all the gentleman who had in his original agreement offered the land for 999 years at a rental of £1 per annum, came forward with a further offer. This was to sell the land to the trustees for £170 and then he capped this with an additional generous gift, by handing back the money as his contribution to the Building Fund. This enabled plans to go forward for the construction of a new brick built chapel. In order that the proposed new church could be constructed on the site occupied by the temporary one, it became necessary to remove the wooden building to a position at the rear, for the site occupied a central position on what was to become a busy main road in the years that followed. Some of the old "worthies" have relished the re-telling of that red letter day and the adventures encountered on that Whitsun Bank Holiday Monday in the Spring of 1885, when they, the members, assisted by friends, using hydraulic jacks and other implements, rolled, pushed and shoved the wooden building far enough back to be clear of the site on which the new building was to stand. Apparently the movement was too severe for the timbered structure and the story goes on to say that such treatment almost broke its "back". Indeed, for the rest of its days it needed a partition across the middle to support the roof, forming two rooms , which in later years were put to good use. In July of the same year the foundation stones were duly laid and it is of interest to note that the name of the Reverend R.S. Blair is thus recorded, a fitting tribute to the man to whom we are greatly indebted, not only for the efforts he made towards the securing of the site and the building of the churches, but also for the fact that he saw fit to place on record the events of those early years. The new brick church was so completed at a total cost of £1,123.18s.2d, of which £673.18s.2d had been raised by the time the building was opened. 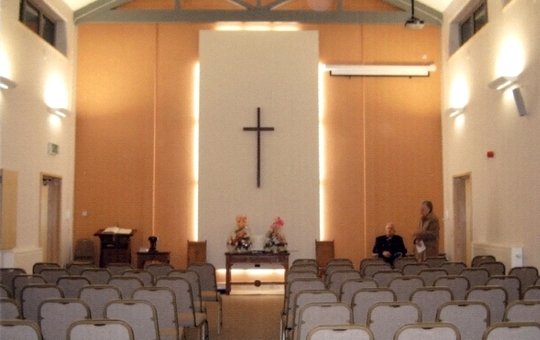 In making reference to the engraving included in this booklet the top of the old wooden chapel can be clearly seen to the left and rear of the new building. This building itself possessed no architectural features of any note, in fact it was nothing more than a plain rectangular structure with a roof, the eight large windows supplying the maximum amount of daylight to the interior, and but for some internal alternations which have been carried out through the years, the main structure has remained unaltered. 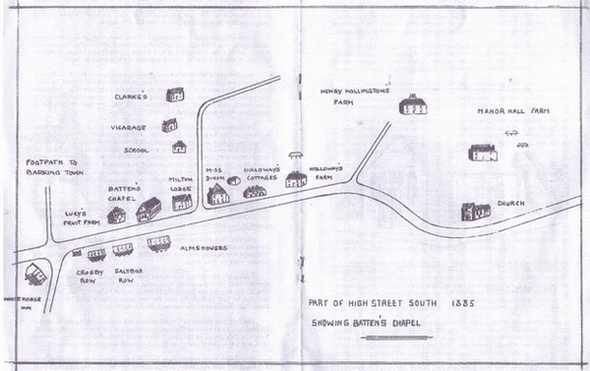 In a map held in the local library, which was drawn in the year 1885, the church is referred to as Batten's chapel, and is shown as standing between Milton Lodge and Lucy's Fruit Farm. From then on, the story unfolds, with each succeeding generation making its own contribution to the life and worship of the church. So far only one member of the church has been named in person. What a mammoth task it would have been even to attempt to list the characters and personalities who have made their own individual contribution during the 100 years of history. Some of the readers of this booklet will no doubt be disappointed to find that some of these special people have not been named; disappointed in as much as some of the red letter days could have been re-lived and their own experience enriched in the re-telling. Even if it were possible to list but a few, I feel we would receive from these men and women themselves a few words of timely advice reminding us all that in assessing the achievements of any great adventure, the people who carried out the menial tasks have their place of honour in the final reckoning. It is realised that there are some folk who may read this booklet who can give of their own experience and tell the stories of the momentous events of the passing years., when as small children in the Sunday School they too played their part. Today finds them scattered throughout this land and even in other parts of the world. And so we take our time to pause for a short while to look back and perhaps a reminder of our heritage at this point would not be untimely. East Ham is part of the London Borough of Newham and is in East London. It is a very dynamic place to live with much new development taking place alongside traditional industry and housing. In 2012, Newham played host to the Olympic games, with the main centre at Stratford, about 3 miles or so from East Ham. A good summary of the area can be found at Newham Council's web site. in East Ham welcomes you ! Pictured above is the logo of the WCC. The word "Oikoumene" is Greek for the whole inhabited earth. Please visit the rejesus web site.